I. Paestan red-figure lekythos, an oil flask depicting a man holding a plate of fruit, dating to 340 B.C. and valued at $9,500. II. Sardinian bronze warrior wearing a helmet and carrying a bow, dating to the 8th century B.C., and valued at approximately $30,000. III. Proto-Corinthian oenochoe, a wine jug decorated with rams and panthers, dating to 650 B.C. and valued at $22,500. IV. Sardinian bronze ox dating back to the 8th century B.C. valued at $6,500. V. Attic red-figure lekythos, an oil flask depicting a man holding a lyre, dating back to 430 B.C. and valued at $12,500. VI. Apulian Xenon kantharos, a drinking cup decorated with the image of two goats butting heads, dating to the late 4th century B.C. and valued at $8,500. VII. Greek bronze Herakles holding the horn of Achelous, dating to the 3rd or 4th century B.C., and valued at $12,500. 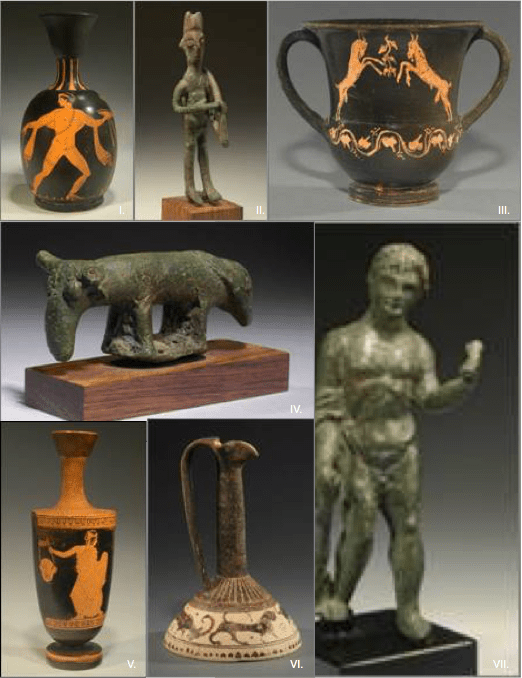 Celebrating a repatriation decades in the making, U.S. and Italian law enforcement gathered in New York on Thursday with ancient statues, flasks and other artifacts set to be returned overseas. Bronzes of a Sardinian warrior and ox from the 8th century B.C., a Greek bronze of Heracles believed to be from the 3rd or 4th century B.C., and an oil flask of a man holding a lyre from 430 B.C. stood among the recovered relics. The Manhattan District Attorney’s office seized the objects — collectively valued at $90,000 — in April from an unnamed Manhattan gallery, whose owners faced no charges after agreeing to forfeit the pieces. “We know after doing several of these ceremonies that no price tag can be put on this cultural heritage,” Assistant District Attorney Karen Friedman Agnifilo said at a press conference. In the past few years, District Attorney Cyrus Vance has placed increasing emphasis on retrieving cultural heritage, returning a stolen sarcophagus to Greece’s consul general earlier this year. Last year, his prosecutors seized and transferred 10th and 11th century Indian statutes and a 2nd century Buddhist sculpture from Pakistan. Italy’s consul general Francesco Genuardi signed for and accepted the latest objects this afternoon. “I think these pieces of art are a powerful display of importance that we attach together to the preservation of art heritage everywhere and how we work shoulder to shoulder to preserve it,” Genuardi said. Though the details of antiquities’ journeys are murky, art-crime prosecutor Matthew Bogdanos traced their disappearance to tomb robbers so common in Italy as to have spawned their own word. “The antiquities themselves that you see before you were stolen by tombaroli in the early 1990s to late 1990s, doing what they do best, which is completely destroying the previously unlooted or undiscovered tombs or burial sites or places of archeological or cultural significance,” he said. Now a resident antiquities expert in the District Attorney’s Office, Bogdanos rose to prominence in the art world as the Marine Corps colonel who spearheaded the investigation into the looting of Iraq’s National Museum in 2003. Once removed form the burial site, Bogdanos said, the objects “then make their way through the byzantine architecture that ultimately attempts to launder these pieces through publications with various organizations and various auction houses.” Bogdanos could not estimate how many have yet to be found, but he said that the looted archives of some of the most well-known smugglers — Giocomo Medici, Gianfranco Becchina, or Fritz Burki — show they number to be in the thousands. For Genuardi, this afternoon’s announcement prompted celebration, and he said the artifacts would be the centerpieces of an exhibit coming to Italy’s New York consulate on June 2. This article was copied from Courthouse News Service. 2017-06-13 in Illegal excavations, Italy, Selling of unprovenanced items.